I’ve heard it said that art is a time traveler. It’s true. Art leaps through history and across continents, through reality and the surreal, moving faster than any car or flight. It’s a time traveler who allows us to sit at its windows and visit destinations that awaken, challenge, and inspire. Yet, to call Dr. Greg Metz, senior lecturer at UT Dallas, and research assistant Katrina Saunders tour guides would be an understatement. Dr. Metz, a long-time artist and curator of Derive Art, and Ms. Saunders a designer at Derive Art, are time travelers in their own right, creators of time-defying spaces, and researchers who have dedicated their lives to promoting art education. Dr. Metz’s venture, Derive Art, is an art service that specializes in bringing contemporary artworks to the workplace. 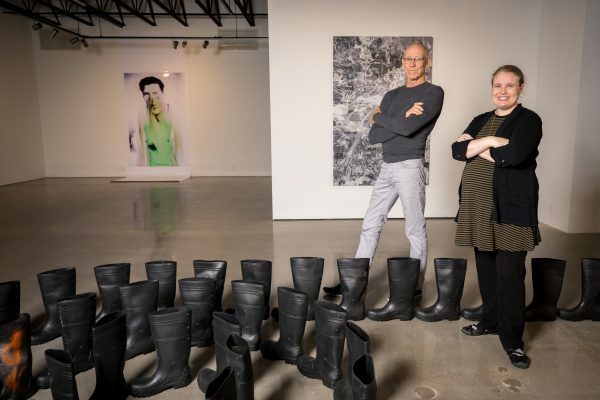 As a service, Derive Art provides artwork installations for rent and acquisition, but the goal of Dr. Metz and Ms. Saunders research is more impactful than feng shui. While their multifaceted approach to introduce artwork into the workplace creates a platform for employees to become knowledgeable about art, as well as spark interesting conversations about the world around them, their work aims to solve an underlying problem that Dr. Metz understands very well. Fuel cost? The artwork has to at least be transported, right? The dilemma they work to solve is trickier. Their ‘research challenge’ more importantly focuses on the disconnect between the art market and larger public audience; thus encouraging a new, more informed collector base which could reduce the impact that stagnating sales have on the livelihoods of artists. Several factors affect the market. Earlier this year, The Guardian ran an article which examined two major auction houses – Christie’s and Sotheby’s – and gave insight to some of these pressing changes: overhead, court battles, and costly seller-guarantee systems. For those who aren’t as familiar with the art world, limited knowledge of art and artists may stall or prohibit an opportunity to invest in creative pieces; stagnating the art market further. “We saw a market for change,” Dr. Metz told us. With research conducted in Europe, Dr. Metz interests became twofold: he held an interest in expanding the market by introducing artwork into working spaces and was also curious how changing a working environment could benefit employees, the company, and branding. To begin, he needed to convince those unfamiliar with art that incorporating it into the workplace would create change, such as a spark of creativity to increase employee engagement and boost productivity. Published last year in Gallup, only 32% of workers in the U.S. were considered to be engaged with or in their jobs. Over the last few years, Forbes has taken note in employee disengagement, particularly in regards to the influence that working environments play in productivity, including examining the deeper effects of artwork on the well-being of workers. Not only does the research Dr. Metz and his team conduct contributes to this work place conversation, but they bring a twist. While workplace inspiration is a hot topic on the internet, a quick Google search reveals a subtle dialogue that Derive Art is tapping into: considering the livelihoods of artists, as workers, too. For his research, Dr. Metz held initial interviews to solicit employee interests, generate ideas, and examine the organizations space. After mining his research and narrowing down a proposal of artists, Dr. Metz and his team used Photoshop to incorporate images into the work spaces for a realistic interpretation of how art can transform a space. Art education also plays a key role in Dr. Metz’s art selection process. Integrating art into the workplace is also a didactic endeavor for Dr. Metz, Ms. Saunders, and their clients. The Derive Art team familiarizes themselves with the background interests of employees and the overall business culture, and introduces them to the functions which art perform, how art is valued, and makes determinations on art selections based on how the organization relates. Adding depth to Dr. Metz’s research and expansive art knowledge, he also incorporated a model to explore workplace culture. By implementing the Competing Values Framework model, Dr. Metz and his team look at the various needs the workplace supports. By understanding how office space design and other elements such as furnishings can play into an organizations culture, designers Dr. Metz and Katrina Saunders goal is to introduce art that challenges and inspires; art that stimulates and increases productivity. After artwork and installations have been initiated into the workplace, Dr. Metz and his team surveys employees to learn how the change affects them. The results are surprising. Results from the Derive Art survey revealed that 75% of employees had new things to discuss and formed new lines of communication between employees that hadn’t existed before. Also, an interest in art increased over time among workers and the presence of it brought creative stimulation to projects. Their research also revealed that artwork habituates after six months. Once employees have become accustomed to seeing a piece of art, Dr. Metz says, “Nobody sees it. It just becomes a blind spot.” To keep the atmosphere from stagnating, Dr. Metz’s team rotates artwork every six months. With each new piece that is introduced into the environment, the Derive Art team is able to gain feedback to gain insight on new artwork to bring into the spaces in the future. When Dr. Metz and Ms. Saunders are not traveling from galleries and businesses transform lives and workspaces, they each enjoy partaking in art activities. Both agree it’s their history and a deep part of their lives. Dr. Metz also enjoys playing old-timers fast pitch hardball and sailing, exploring art scenes, as well as traveling to the Chianti Mountains and Big Bend. Ms. Saunders engages with connections in the art world here in Dallas, meeting new artists, talking about their work, and thinking about the work of new artists in correlation to Derive Art. Like art, they are always on the move, bringing together people and ideas to the windows of new worlds.